Allatoona Lake Recreational Facilities - Amenities: Featuring over 1,000 secluded RV and tent campsites found along the shoreline of this 12,000 acre lake. Visitors can experience the wonders of nature, dive into water sports and generally relax knowing that your never more than 10 minutes from town. 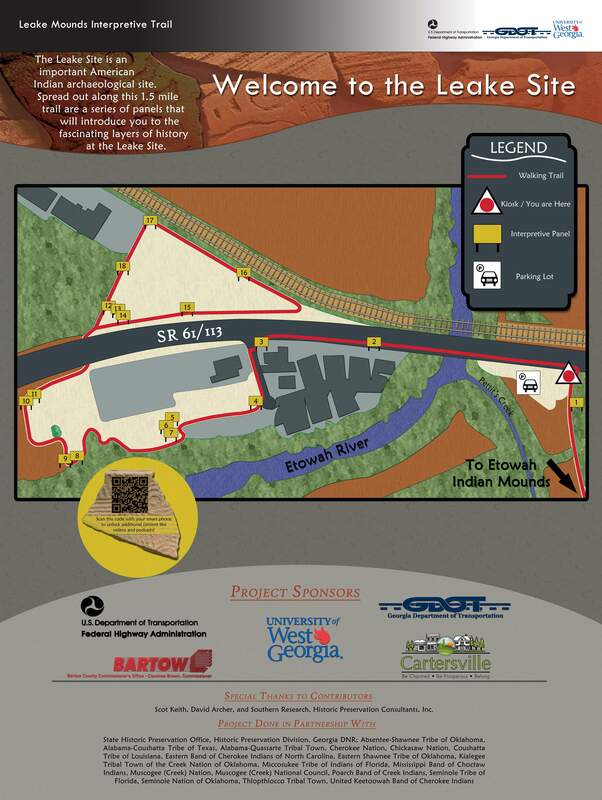 A stop at the Visitors Center will provide you with detailed maps of the lake and recreation areas and will introduce you to the history of Allatoona Lake, Bartow County's geology, the Native American culture and the Civil War. The Overlook provides soaring view of Allatoona Lake, its dam and the Etowah River below. Hiking trails end at the river bottom. 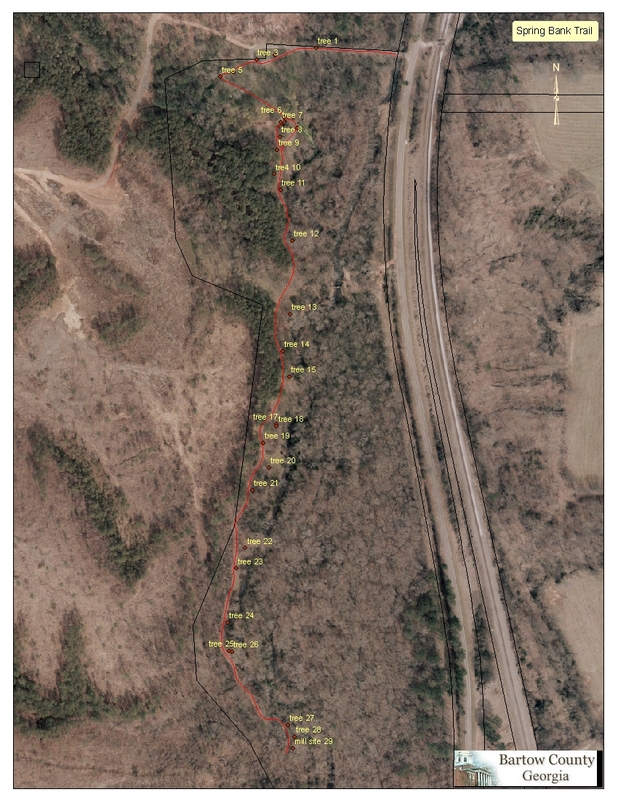 Trail maps for the following trails are available at Allatoona Lake Project Management Office/Visitor's Center & Overlook - 8 AM-6 PM (summer), otherwise 8 AM-4 PM. Open daily. Handicap Accessible. Listed on the National Register of Historic Places. Maintained by the US Army Corps of Engineers. Located in the foothills of the Blue Ridge Mountains, this is the oldest Corps lake in the southeastern U.S. No admission fee to visit. Beautiful free fun for everyone. There are camping fee charges. To make online reservations, go to www.reserveusa.com or call 1-877-444-6777. All major credit cards accepted. Click on link above for more Allatoona Lake info. Phone: 678-721-6700 - Directions from Atlanta: Go north on I-75 to Exit 290. Turn right on GA 20 then immediately right on Spur 20. Follow Spur 20 with caution approximately 4 miles to the dam and visitor center. Atlanta Campaign Pocket Park - Amenities: One of five Atlanta Campaign Pocket Parks was constructed at Cassville by the WPA in the 1930's. The park commemorates The Cassville Affair. Nearby are additional monuments, markers and the Cassville Confederate Cemetery. Phone: 770-387-1357 - Location: U.S. Hwy 41 N. & Cassville Rd, Cassville, Georgia 30123 - Directions: I-75 Exit 288 GA 113 S, US 41 N, 7 miles, RT on Cassville Rd. Center Community Building - Amenities: 1 Small meeting room Kitchen area and restrooms. Free for small groups. Phone:770-387-5149 - Address: 682 Center Road, Cartersville, Georgia. Walking Trail around facility. Dellinger Park - Amenities: Family-oriented park, with 13 lighted tennis courts, 6 softball fields, football/soccer field with 440 track, 4 shelters (available for rent), 4-acre lake with gazebo, 2-mile walking trail with 20 exercise stations, 2 playground areas (ADA accessible), 2 basketball courts, restrooms, Olympic-size pool, Putt-Putt. Walking trails include the Vita course with a 2-mile outer loop and 1.3 mile inner loop, with exercise stations offering calisthenics instructions. Cinder surface; rated easy; emergency call boxes available and lighted course are provided on trails. The main office for Cartersville Parks & Recreation Department is at Dellinger Park. 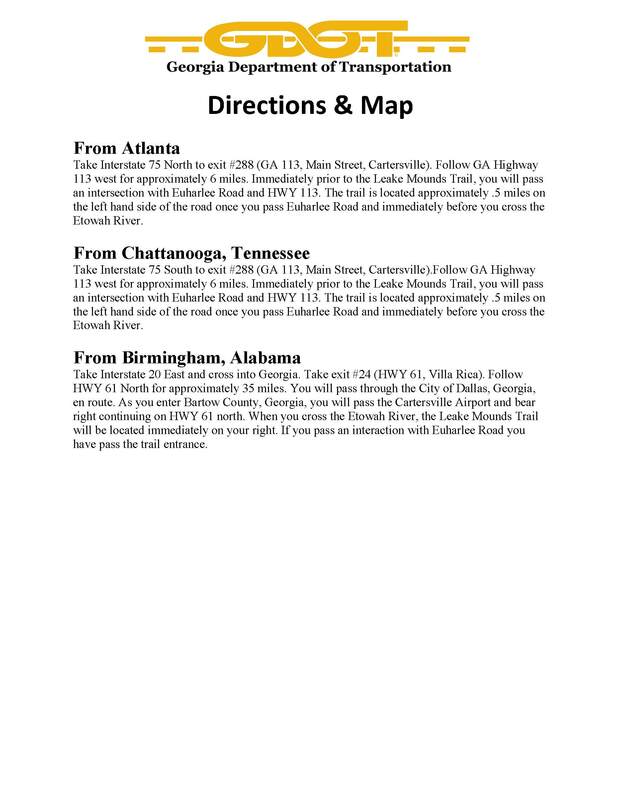 Phone: 770-387-5626 - Address: 100 Pine Grove Rd., Cartersville, Georgia 30120 - Directions: Take I-75 Exit 288, GA 113 south 2.5 miles to downtown Cartersville. Cross railroad and follow signs 2.5 miles to Dellinger Park. Manning Mill Park and Youth Facility - Amenities: 1 lighted baseball field, 5 lighted baseball/softball fields youth playground area, large picnic shelter (reservation only), 3 restrooms, 1.4 mile lighted walking trail and 5-acre lake. The 1.5 mile trail runs alongside the outside of the park, lake and baseball fields. The lighted trail has a gravel surface and is rated easy. Phone: 770-387-5149 Address: 163 Manning Mill Road, Adairsville, Georgia 30120 - Directions: Take I-75 Exit 306, GA 140 west one mile, then left on US 41 south. Continue approximately 2 miles to Manning Mill Road on left. Park is ahead on the right. 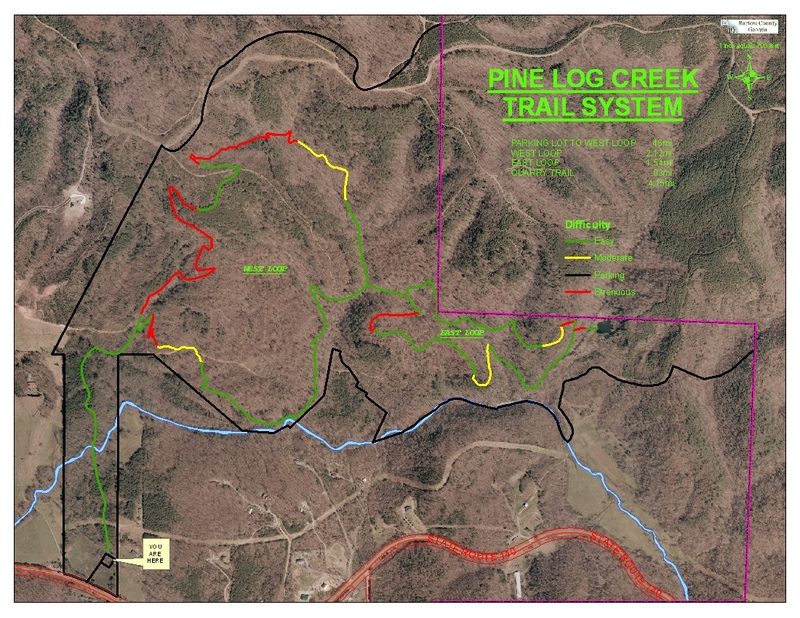 Pine Mountain Recreation Area Trails - Amenities: Total 4.38 miles: East Loop 2.34 miles, West Loop 1.57 miles; 4 hours steady pace; compacted soil surface; moderate to difficult. Spring Bank Trail (Google Map) - Home of the largest white oak in the state of Georgia. Se the Georgia State "Champion White Oak Tree" - 37 acre greenspace since 2002. Pre civil and civil war Historic - Charles Wallace Howard Home. Approximate 1 mile in and 1 mile out trail. Very easy, however difficult for wheelchair. Reservations and Contact: To make online reservations for any of the following sites go to www.recreation.gov. You may also call (770) 382-4700 or 1-877-444-6777. All major credit cards accepted. For more general info on Lake Allatoona camping call 678-721-6700. Allatoona Lake Recreational Facilities - Amenities: Featuring over 1,000 secluded RV and tent campsites found along the shoreline of this 12,000 acre lake. Click on link above for more info. Clark Creek North Campground - I-75 Exit 278 east. - Amenities: 24 campsites, shower washhouse with hot showers, laundry, boat launch, dump station, park attendant on duty. Pets allowed (limit 2 pets, no vicious animals permitted). Open April-Labor Day. Clark Creek South Campground - I-75 Exit 278 east. Amenities: 40 campsites, one handicapped site, shower washhouse with hot showers, laundry, boat launch, beach, dump station, park attendant on duty. Pets allowed (limit 2 pets, no vicious animals permitted). Open April-Labor Day. McKaskey Campground - I-75 Exit 290 east, then right onto Spur 20. Amenities: 51 campsites, two handicapped sites, shower washhouse with hot showers, laundry, playground, boat launch, beach, dump station, park attendant on duty. Pets allowed (limit 2 pets, no vicious animals permitted). Open March-Labor Day. McKinney Campground - I-75 Exit 285 east or I-75 Exit 278 east. Amenities: 150 campsites, two shower washhouses with hot showers, one handicapped site, laundry, beach, dump station, boat launch, park attendant on duty. Pets allowed (limit 2 pets, no vicious animals permitted). Old Highway 41 #3 Campground - I-75 Exit 283 west, south on GA 293. Amenities: 50 campsites, shower washhouse with hot showers, laundry, playground, boat launch, dump station, park attendant on duty. Pets allowed (limit 2 pets, no vicious animals permitted). Open April-Labor Day. Upper Stamp Creek Campground - I-75 Exit 290 east. Amenities: 20 campsites, one handicapped site, shower washhouse with hot showers, boat launch, beach, dump station, park attendant on duty. Pets allowed (limit 2 pets, no vicious animals permitted). Open mid April-Labor Day.